Mow the lawn one last time before the winter if you get a chance when it's dry. Don't mow it if it's very wet as it often is at this time of the year as you'll make a mess of it and it won't get a chance to recover before the spring. Put wooden garden furniture away for the winter. If left out hardwood furniture will survive better than softwood (pine), but it will still start to rot in the constant damp and so if you won't be using it until the spring, best to store it under cover and away from the wet ground. If you really don't have any room to store it under cover, then at least move it off the grass so the legs aren't wet, propped up against the house / shed etc. out of the way will reduce the amount of rain falling on it. A large plastic sheet or purpose-made cover works well too. Plastic garden furniture also benefits from a bit of care, keeping it out of the weather will help keep it cleaner. Whatever you do, don't leave furniture on the lawn over the winter, you'll unlikely to move it much and at the very least, the grass under it will be shaded and will suffer. If you have a large shrub or tree that you have thought about moving from one place to another in the garden, then the late autumn and early winter is the best time to do it successfully. 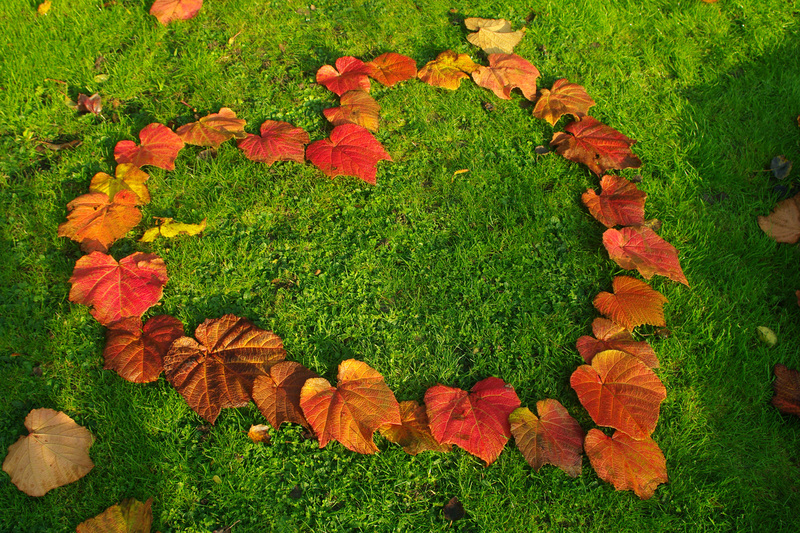 For deciduous plants, wait until all of the leaves have fallen off. Dig the plant up with as large a root-ball as possible, move it to its new position and re-plant as soon as you can. Mix plenty of well rotted organic material, garden compost or farmyard manure into the new planting hole to help get the itinerant plant off to a good start and pile a load on the surface as a mulch. Stake if necessary to prevent the wind from rocking the roots until the plant gets established. A short stout stake just a foot or two high is better than a tall one that is tied to the tree at 4 or 5 feet above the ground. The main point of staking is to prevent wind-rock of the roots. 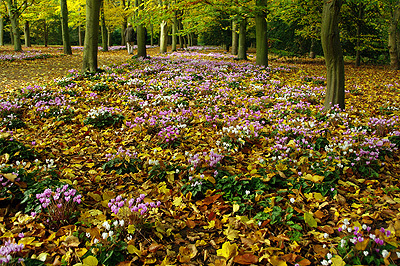 Take hardwood cuttings of trees shrubs and climbers. These are the easiest of all cuttings to take, but are rarely taken as the results are not evident for 6 months or more and most people don't like gardening when it's cold and wet! Take healthy 15-30cm lengths of stem (an excellent use for prunings) and place about 1/3rd in, 2/3rds out of the soil (extra organic matter will help or some sharp sand dug into heavy soil) in a shady spot. Choose an out of the way part of the garden and leave the cuttings until late spring / early summer when you can dig them up and plant elsewhere. A cloche or coldframe over the cuttings helps. Lazy gardeners tip. Spread organic material around your garden as a mulch now and come the spring it will have largely been taken underground and mixed in by the worms saving you an awful lot of digging in in the process. So if you've any garden compost left over and don't anticipate any need for it when doing any new planting, spread it around your beds and then just sit back and let nature take its course. It only really works this way at this time of the year as it stays moist all the time, not drying out and earthworms are more active than they are in mid-summer when they often go into a kind of hot dry weather hibernation (aestivation). Place a net over your garden pond if you have one and if there are deciduous trees nearby. Plant any shrubs, perennials, trees etc. that you had planned. This is an excellent time for planting and the best time of year. It gives the plants a chance to get a decent root system before they become dormant, it also protects the roots from the worst of frost being below the ground rather than in a container. Come next spring, the plants are there from the start to make growth directly into the surrounding soil. 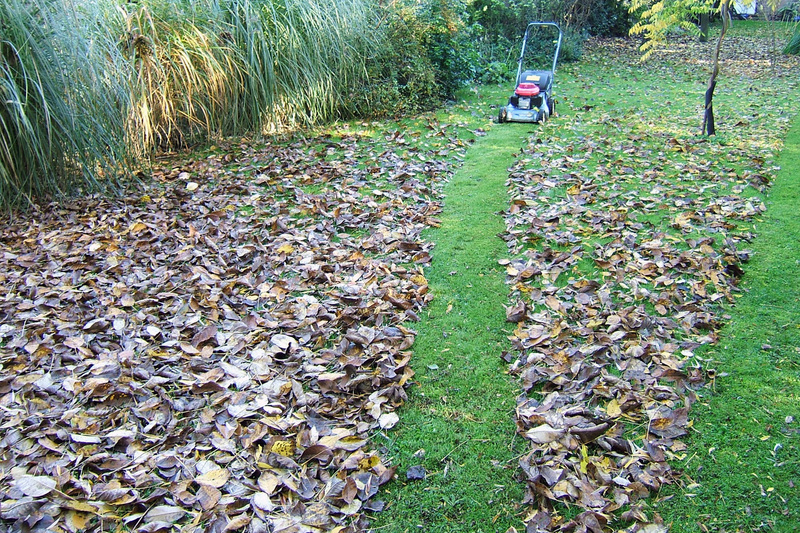 Use the lawn mower to collect, shred and mix fallen tree leaves with some nice soft grass clippings these will mix together and raise the temperature to get them rotting very nicely from the outset. 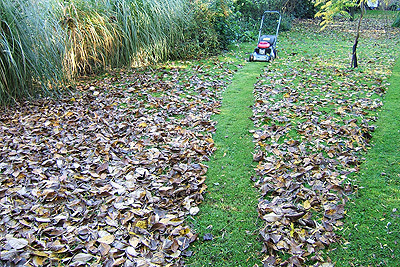 This isn't always an option as often by November the grass may have stopped growing and the lawn may be too wet to do this. If you can, it's a great way to deal with at least some of your fallen leaves. You need a rotary mower with a grass box and you'll end up emptying the box about 3-4 times more often than normal. Put the grass box on and set the blades to a fairly high setting, it's very satisfying to do as well, a bit like vacuuming the lawn clean. Bare Roots and Balls for Winter and Beyond - This is the best time to plant bare rooted or root balled trees, planting while dormant reduces stress on the plant. In the spring, when it wakes up again the new roots go straight into your soil so establishing better and more quickly. 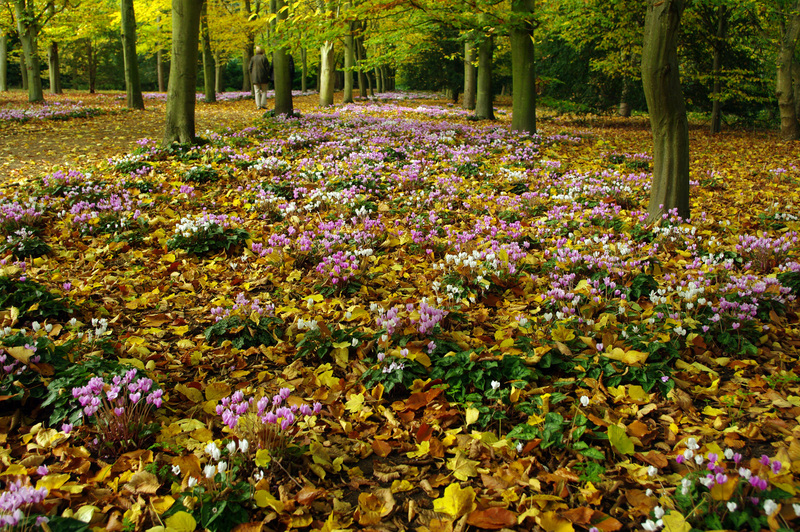 Late autumn and winter are the best times to plant trees and hedges of any size and particularly of larger than normal specimens (2m +). Do it at the right time for the plants rather than when you think about it (i.e. spring and summer). Apples plant in 2's with a pollination partner for best results e.g. Cox, Discovery, Kidds Orange Red, Sunset 10ft x 10ft approx. mature size. Pears plant in 2's with a pollination partner for best results e.g. Beth, Ormond, Winter Nelis, Conference. 12ft x 12ft approx. mature size. Burglar proof - Along a boundary, near a conservatory or a short run near an exposed downstairs window for example. Ornamental plants with plenty of spikes and thorns that effectively deter burglars and intruders. 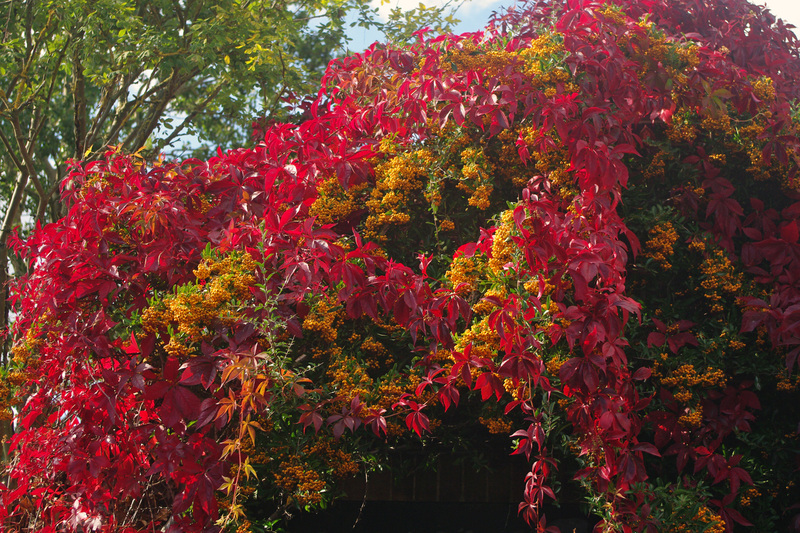 Pyracantha and Berberis, evergreen or deciduous, green leaves / golden leaves / red-purple leaves. Flowering and / or with autumn berries.